"Here we will build a monument dedicated to nature and we will make it our lives' purpose." 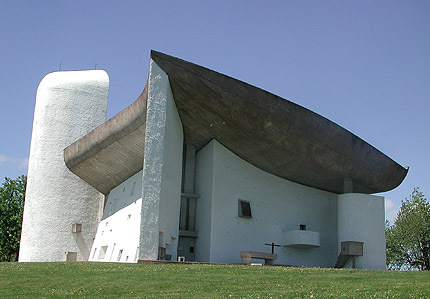 Le Corbusier's "chapel of our lady of the height" is a pilgrimage chapel, though on most days more frequented by architectural pilgrims than the intended variety. 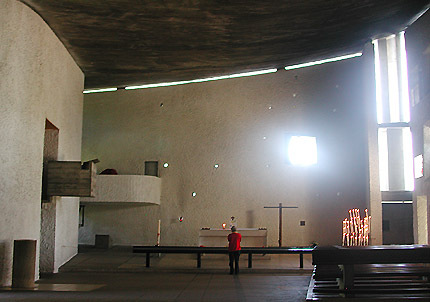 Perched on a commanding hill above the village of Ronchamp, it is the latest of a long history of chapels on the site. Its predecessor was destroyed in fighting in the Second World War, though much of its stone is used in the walls of Le Corbusier's building. The thick, curved walls - especially the buttress-shaped south wall - and the vast shell of the concrete roof give the building a massive, sculptural form. Small, brightly painted and apparently irregular windows punched in these thick walls give a dim but exciting light within the cool building, enhanced by further indirect light coming down the three light towers. 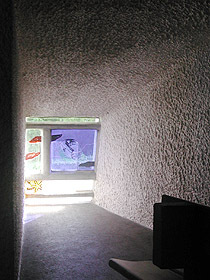 "The shell has been put on walls which are absurdly but practically thick. Inside them however are reinforced concrete columns. The shell will rest on these columns but it will not touch the wall. A horizontal crack of light 10cm wide will amaze." The interior of the chapel is modest, with plain pews down the south side only. 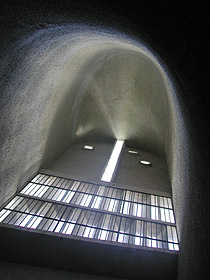 The walls curve, the roof curves, and even the floor curves down towards the altar, following the shape of the hill. 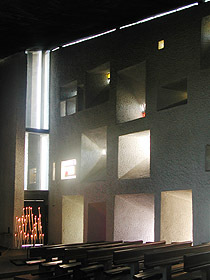 Above the plain altar, the east wall is punctuated by several pinhole-windows and by a single substantial window with the Madonna and Child in silhouette; through the window this image also serves the outside altar used during pilgrimages. "[The] south wall provokes astonishment. Vertical triganular frames of reinforced concrete 16cm thick varying, at the base, from a width of 3m70 to 1m40 to 50cm at the top, carrying the immense, spreading shell of the roof; the rest, the bays, embrasures and splays which break up the interior wall (and scarcely puncture the facade) is a membrane of concrete 4cm thick sprayed on to expanded metal by cement gun." 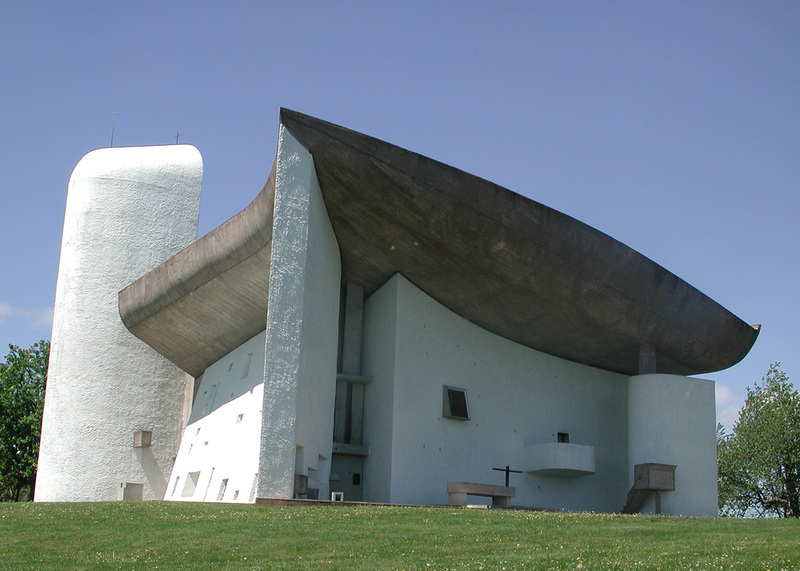 The complex shapes at Ronchamp start from a theme of acoustic parabolas, playing a practical role on the east wall to reflect the sound from the outside altar for the pilgrims gathered on the hill. 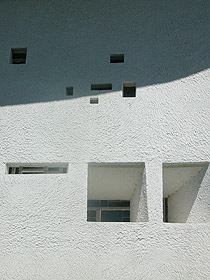 Simple, geometric shapes from Le Corbusier's earlier buildings have given way to more subtle, fractal, "natural" shapes here, leading to the description of Ronchamp as the first Post-Modern building. The chapel is open to the public. Opening hours are 9.30 am to 6.30 pm from April to September, and 10 am to 4 pm. Major pilgrimage services are on 15 August and 8 September. +33 3 84 20 67 51. 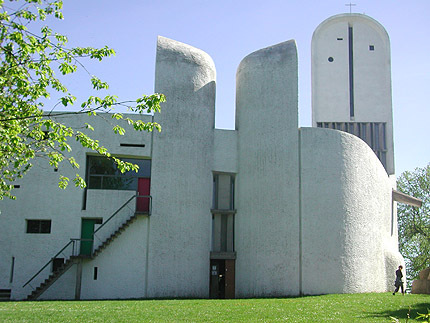 Ronchamp is a little over an hour's drive west of Basel-Mulhouse, the airport near the French/Swiss/German border. From Mulhouse follow the A36 southwest to Belfort, then the N19 west to Ronchamp. A steep windy road to the North is signposted to the chapel from the center of Ronchamp village. Other architectural sites within striking distance are Jean Nouvel's theater extension in Belfort, Renzo Piano's Beyeler Foundation over the Swiss border in Basel, and various architects' buildings at Vitra, just over the German border. William J.R. Curtis Readable (quite detailed) account of Le Corbusier's work, well illustrated and well structured. Charles Jencks A hefty but accessible analysis of Le Corbusier's life and work, drawing on his writing and painting as well as building design.